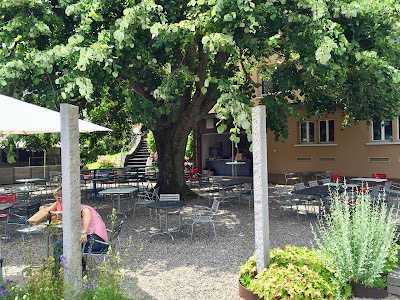 This wonderfully located restaurant on the Aare between the two towns of Olten and Aarau in the Swiss Mittelland is worth a culinary trip! Not only is this a place for lovers of fine food, but the Bruecke has also the most picturesque outdoor area of the region. My husband and I are regulars at this prime address for foodies in the region, where you find inventive and classic dishes equally. Everything is expertly prepared and nicely presented. We normally go for the more modernist creations. The chef knows how to combine different flavors and textures resulting in a successful composition. After years by experimenting with concepts menu-wise I think that the restaurant has now found a good way. 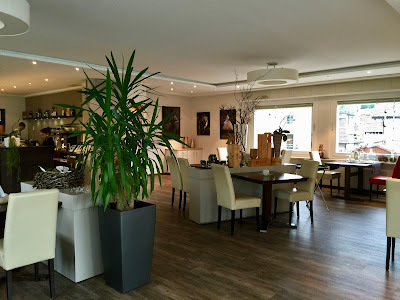 There are 3 menus: the refined linden tree menu (there is a 100 years old linden tree midst the outdoor area), the classical and the inexpensive one. Each consists of 4 courses (dessert is separate), but you can combine all the dishes offered in these 3 menus as you wish. In addition, there are 4 signatures mains, which can be built in as well, and 4 dessert options to choose from. When the weather allows it, the meals are served outdoors. On this occasion, there is a special grill menu. The chef cooks all kind of things on a charcoal barbecue cooker onsite. This summer, I visited the restaurant twice, once for dinner inside and the other time for lunch outside. For dinner we decided to have 4 courses each. Whereas some of us went rather for the classics, my husband and I opted for innovative dishes. The most outstanding of the latter category were the following ones. Regarding starters both the variation of asparagus and smoked bacon from the Manculiga pig as well as the essence of garden peas with a quinoa-peas-beans salad, pulled pork and cacao were a feast for the eyes and the palate. 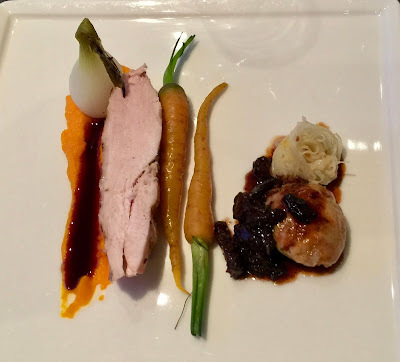 The same can be said for following mains: a slightly smoked Scottish salmon with asparagus and fennel on the one hand and a poularde made in two ways with morels, spring carrots and onions on the other hand. 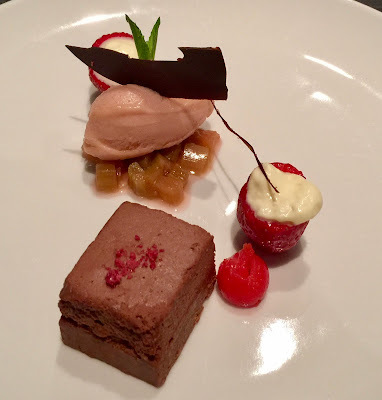 A real treat was also the dessert, a chocolate cake on brittle with sorbet of rhubarb and strawberries filled with custard. When we had lunch outside, all of us opted for classics: house salad, pan-fried perch fillets and ice cream. Everything was perfectly prepared and tasty. The hosts Markus & Sarah Gfeller and the chef Thomas Messerli together with their team do a good job when it comes to hospitality. They are always friendly, competent and do everything that you feel cared for as a guest. The restaurant’s interior is bright and airy thanks to large windows with views of the river and tables not too close to each other. The furnishings are modern and unfussy, no unnecessary gimmicks distract you from culinary experience. The exterior is – as already mentioned – hard to beat, at least in the region. It is such a lovely experience to sit under the old linden tree and to contemplate how the river flows. 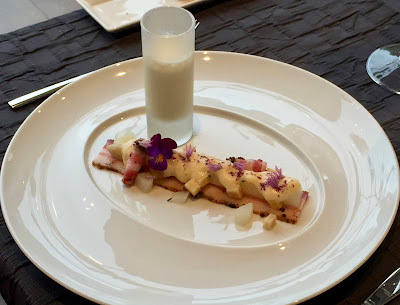 As far as the price level of the restaurant is concerned, you get upmarket cuisine at the Bruecke and such food experiences do not come cheap. Prices are quite expensive, but there is always an affordable choice on the menu. Overall, Bruecke is your choice when looking for seriously good food, either classically or inventively prepared. Food is incredible, staff is warm and attentive and the location is hard to beat on a sunny day (outdoor seating).